Nan is another D-Mom that I met on Twitter. You’ll read in her story that Twitter is such a wonderful place to make connections, ask questions, and find support. Nan has been there for me in all of those capacities! I invite you to read about Nan and her daughter Claire. I’d like to introduce you to Nan of My Pump Gear. Claire is nearly 8 years old. She is the typical second grader. She loves anything to do with animals…stuffed, real, whatever! She has two older brothers. She is a soccer player and does gymnastics. She just tried out for the city softball league. Her favorite color is purple…and pink, and blue, and green, and…you get the picture. She is full of energy and a friend to many. She makes us so proud! Claire was just 22 months old when she was diagnosed. She was still in diapers, still in a crib and still non-verbal. I feel quite fortunate that she was diagnosed. In hindsight, she had all the classic symptoms: extreme thirst, excessive urination, weight loss. She began vomiting intermittently (not like a typical flu bug). After several trips to the doctor, we ended up in urgent care. What landed us in the emergency room was the shortness-of-breath she seemed to be experiencing. She began to pant, as a dog would. She also had a fever that would not quit. It went on for close to a week even after diagnosis. Later, in the hospital, we figured out that the ER nurse had been giving her sugar water! Our diabetes team has told us on more than one occasion…if Claire ever needs to be hospitalized, we, as the parents, need to be there every second…for this very reason. Even trained medical personnel are not educated about this disease. She was an infant still. So I am fairly certain she has no recollection of life before diabetes. However, her little life certainly changed. I have had so many people tell me how lucky we were that it was diagnosed early so that she doesn’t know life without it. I do not see it that way. If it could have been postponed in her life, I would have taken that option for her. Her toddler years were wished away. It was a difficult period of time. While other little kids could pick at their food and eat whenever and whatever…Claire was on a regimented diet and time schedule. Her fingers and toes were continually poked many times a day. Insulin was injected into her little body several times a day. She wasn’t able to tell us if she was experiencing a low. It was stressful and consuming. So, did her life change for better or worse? Yes, her life changed for the better and for the worse! It was for the better because, well, she was diagnosed. We know of children who were not as fortunate and their lives ended. Insulin made her well again. So, from that perspective, her life is great! On the other hand, has she ever told us she doesn’t want to have diabetes? Yes. It’s consuming and it sets her apart. 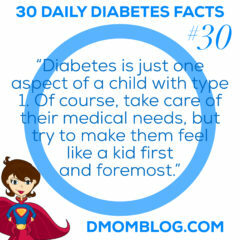 And although we try everything we can to make our family life normal with diabetes, it’s not. What is normal about having to inflict wounds in your child’s finger 8-10 times a day to draw blood? What is normal about inserting a continuous stream of insulin into your child through a catheter every 3 days? But, in between all the finger pokes, the carb counting and the site changes, life does go on. We still have a great family life. We laugh and have fun. We play sports and go on vacations. We celebrate birthdays and even Claire’s dia-versary. Because, though it has changed, life is still good. Oh my goodness. 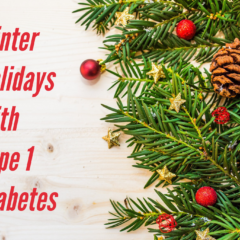 The diabetes online community (DOC) has be invaluable to us (specifically, me). 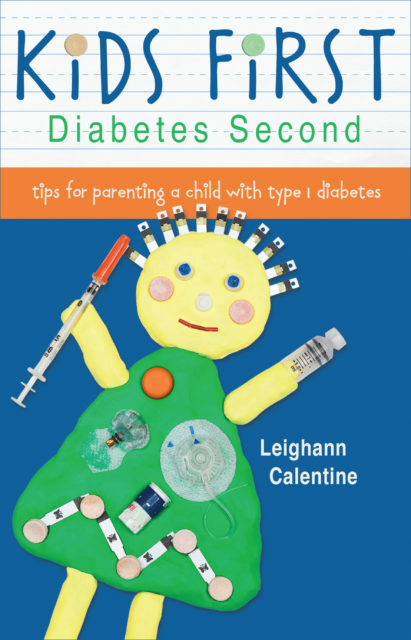 Who would have thought that my initial search: “how-in-the-world can a toddler wear an insulin pump”…could have brought so much real-life knowledge to us regarding diabetes. These people are there…anytime, day or night. 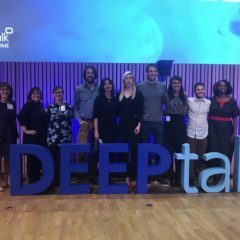 I continue to discover new blogs by parents of T1’s as well as wonderful, witty T1 grown-ups who are living full and wonderful lives in spite of this disease. I can’t begin to write how the DOC has impacted me. There is such an instant bond felt, especially from the D-moms. But even the adult T1’s have been so welcoming to us parents, who really just need to know our kids can grow up and live well. I read blogs and have been inspired to post on our own in recent months. I also find great value in community websites such as TuDiabetes, The Diabetes OC, Diabetes Daily, dLife, and The Diabetes Resource. And now, I’ll certainly add the D-Mom Blog to that list of resources! But I think of all the online places to go, to feel connected to others dealing with diabetes, Twitter might be my favorite. Whether I have a question, an answer or just want to let go of some frustration, people are there, to share and let me know we’re not alone. We have diabetes connections all over the world now! It’s pretty amazing. Claire was first on multiple daily injections for 1 1/2 years after diagnosis. We were not very successful in keeping her numbers in range with this therapy. I remember trying to measure out 1/8 of a unit of insulin at 3 in the morning. It was a trying time, to say the least. 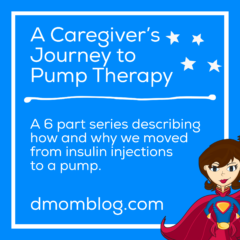 Just shortly after turning 3, she went onto an insulin pump. It was a whole new world for us. But after we got the hang of it, I couldn’t believe how long we had struggled with MDI. There is a lot of work that goes into keeping Claire healthy, as all D parents know. We count carbs like crazy. Claire is getting pretty good at it too. Sometimes the nutrition charts on products are quite confusing with the number of servings and odd numbers of counts. But I’ve been pretty impressed with her math skills, even at 7 years old! On a normal day, Claire checks her BG 8-10 times. Sometimes it’s less. Sometimes it’s more. But that little number is so important for us to know which next step to take in the management of her diabetes. I am very interested in continuous glucose monitors. 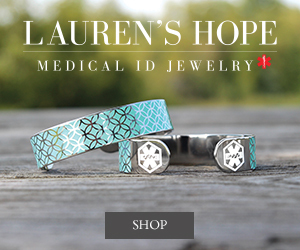 I guess I’ve hesitated because it is yet another infusion-like site for her to wear 24/7 on her little body. However, we do know of several people who have shared about the great benefit of having that much more information to help in the management of diabetes. This may be in Claire’s near future. Strangely, one of the most comforting things a D-Mom ever told me was “Diabetes is really difficult.” This came from the first D-Mom I ever met. I nearly collapsed in her embrace. Finally there was someone else just like me! I needed to know that someone else out there felt this too. All the well-intentioned comments from others like “at least diabetes is manageable”…not so helpful. I definitely have followed this lady’s lead. When she heard that my little Claire had been diagnosed, she walked right up to me, looked me in my blood-shot eyes and said, “Hi, I’m Kelly. My daughter is 7 years old and has type 1. Diabetes is really difficult.” She hugged me, handed me her phone number. I knew that she sincerely meant it when she told me to call her at anytime, day or night. She then handed me a BIG bag of goodies for Claire, along with a cute little purple teddy bear. It included all sorts of fun Band-Aids to make the finger pokes more bearable. Snack foods with all the carb counts circled, stickers, games, and Crystal Light. As you can tell, this made a huge impact on me. And so, I’ve done the same in return when meeting other newly-diagnosed families. Simple and basic: I wish I had known the symptoms of diabetes. As I mentioned before, we had no clue. I truly believe we could have lost our little girl if I had not stayed that long, awful night in the ER. When we meet new friends and they find out about Claire’s diabetes, they most always ask the question “How did you know she had diabetes?” I always tell about all the classic symptoms and how, as parents, we need to be aggressive in the medical treatment of our children. I know that doctors, for the most part, are intelligent people. However, they might not catch everything. And we know our kids best. Do you do any type of outreach or fundraising? Although, we are not involved in a support group, we are contacted from time to time and told about newly-diagnosed families. I feel honored when we can help another family, if just a tiny bit, navigate the confusion they feel with the diagnosis. We have kept ties with 2 local families who have type 1 kids. There is a common bond there. We raise funds through the JDRF walks. We have been involved in 2 different teams in the past. Now that Claire is older, we’ve begun inviting her little friends to join us. Next year we plan on starting our own team. We also give portions of our sales from My Pump Gear to the JDRF and Childrens Hospital Los Angeles. Tell me about your business and how and why you started it. When Claire started on a pump at age 3, one of the challenges was figuring out how a toddler could successfully wear this high-tech device 24/7. In the first couple months we simply used the clip that was included in the box. It snapped onto her waistband. But it was tricky…wearing dresses and flimsy little shorts. And then, there was the difficulty of using the toilet with it clipped onto her pants. It was quite frustrating. At a CHLA’s Family Diabetes Day, Claire befriended a little girl who had a cute pack to hold her insulin pump. We went online and purchased one. It was functional and cute but, in my opinion, the price was outrageous! And I knew that we would need new ones on a continual basis. I mean, a girl needs to accessorize! I was dreading the purchase of another one. One morning, I woke up and was inspired by Claire to make our own. I got out the sewing machine and fiddled around with some scrap fabric. The result? It was ugly. I can’t sew very well! But the dream of getting some insulin pump packs manufactured grew from there. It is remarkable how I have been led to certain people along the journey to My Pump Gear. I learn something new about business nearly every day! 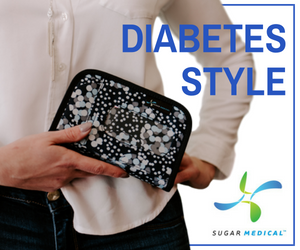 Our mission is to bring comfortable, fashionable, functional and affordable insulin pump accessories to kids and kids at heart! I am in shock about the nurse giving C sugar water!!!! That’s unbelievable and so sad! If the people in the medical field do something like that when they should know better, what chance do we have with the general public! thanks Rachel!! i love all your smiley faces!! : ) i can’t even explain it well…how much friendships like yours mean to me… never met but feel such a tie. thanks for all your supportive words! Nice to meet you Nan. Very good point about how medical professionals know so little about D. Our pediatrician keeps asking ME questions about T1D during our apointments and the nurses caring for our daughter Adele when she got her tonsils out had no clue whatsoever how to manage D. It was absolutely necessary to have one parent present at ALL times during her hospital stay to manage sugars. I was at an appointment with our other child at our local pediatrician. I told her that Q got a pump. She knew about pumps and their advantages, but had never heard of the OmniPod and had no idea that there were tubeless pumps with a remote controller. Though I’m not knocking her for one second because she caught the diabetes early and also caught our son’s heart condition. I just agree that pediatricians sometimes don’t know much outside their basic care. You two reminded me that when Q was hospitalized over night about a year ago (high BG’s, ketones, and then she threw up), I did all the carb counting and gave her insulin with our own pen. I didn’t think of it at the time, but I just wanted to keep on our schedule and use our log book. Plus she was only four and much more comfortable with me giving her the injection than some stranger. Especially after it took THREE tries to put her IV in. I have never been so mad! hi Mike!…great to meet you too!…your daughter is adorable!…i will be hangin’ around your blog now too! Twitter does ROCK! And I’s so glad I met you there, Nan! Your use of the term “consuming” really does depict what living with D is. It IS consuming. Plain and simple. I clearly remember Caleb’s doctor at diagnosis saying it was good for him to get it so early because it will be easier for him to adapt. But he also kindof smirked and looked at the other side of it saying, “although if you are diagnosed later in life then you have fewer years of its effects”. As is often the case, I think this was just another attempt of someone trying to give us something positive to hold on to at such a devastating time, when really, there is nothing positive at all. Like that mom said, this is difficult. It’s counter-intuitive for people to think that THAT is a helpful thing to say. But it really is. Despite it all, you are providing Claire such a great childhood filled with sports, cookies at Sea World, ice cream on D-day and sleepovers! You are a great mom and a great D mom, Nan!